Sportsnet Central Montreal reborn as Montreal Sports Weekly? Montreal Sports Weekly on ICI. I had two things waiting on my PVR this morning: A notification that future episodes of Sportsnet Central Montreal have been deleted from the City Montreal schedule, and a recording of Montreal Sports Weekly, a show I happened to notice on the ICI Television schedule as I was looking for information about its new arrangement with OMNI. You can imagine my surprise when I hit play. Montreal Sports Weekly is a half-hour local sports panel discussion show hosted by Elias Makos with local journalists sitting in high chairs in the City Montreal studio. Makos hasn’t said anything publicly about this show, and his panelists — SN Central Montreal regulars Jeremy Filosa and Sean Farrell — haven’t talked about it either, which seems odd, so I’m not entirely sure what the deal is (the credits say only “COPYRIGHT 2017”). It could mean an announcement is coming, or it could mean that this is just a pilot or something and no one wants to get anyone’s hopes up. Even the description of the show on the electronic program guide — “takes audiences beyond the game highlights for an in-depth look at the city’s professional and amateur teams, along with athlete profiles and feature stories” — is identical to the one first announced for Montreal Connected in 2013, with the exception that it’s described as an “English-language program” for clarity. ICI’s business model involves working with independent producers who buy airtime and create shows that they can sell their own advertising for. Not sure what they wanna do with that yet. The first airing at 9am Saturday featured the same public service announcements and ICI house ads that generally fill the airtime. If this is really a project with a future, the show is going to need sponsors if it’s going to survive. So if you were upset that Sportsnet Central Montreal was cancelled, now is the time to get people to start advertising and supporting this. This isn’t the first time someone has tried an English local Montreal sports talk show on ICI. Adam Reid had a show called Reid Between the Lines, an episode of which can be seen here. He’s since moved on to The Lineup, a sports game show on WatchMojo, which features some local media celebrities. I’ll update this as I get more information about this show, assuming it doesn’t disappear as mysteriously and suddenly as it appeared. Montreal Sports Weekly airs Saturdays at 9am and 6pm, Mondays at 2:30pm, Tuesdays at 11am, Wednesdays at 4pm, and Thursdays at 3pm and 9pm on ICI. Without the benefit of a well-staffed PR machine, Montreal’s ethnic television station ICI has been quietly launching new local programs and improving its service since it launched a year and a half ago. Today, the station launched a free high-definition livestream on its website. Free livestreams of TV stations aren’t very common because of the difficulty securing online streaming rights to content. And livestreams of specialty services are even less so because distributors and consumers complain when they have to pay for a TV service that’s given away for free online. ICI doesn’t have to deal with those problems, because most of its content is original or acquired cheap from foreign countries, and as an over-the-air station it broadcasts for free. Afromonde host Henry Ngaka on his virtual set, as seen through a monitor in ICI’s studio. As radio stations that were supposed to launch in 2013 seek delays in whole or in part because of technical problems, an independent startup television station has managed to get on the air just under a year after getting a licence from the CRTC. ICI began airing regular programming on Wednesday morning, launching on Videotron at the same time. (Apparently on Bell Fibe it’s still “coming soon”.) And so I’ve written about it in this story, which appears in Wednesday’s Gazette, and this story, from a more technical and business angle, for Cartt.ca. As I’ve been watching the channel on and off on Wednesday, I notice it’s been lacking a bit of regularity right out of the gate. There were long awkward seconds of dead air, at one point a single ad or video aired three times in a row, leading to eight minutes between actual programming. The station has very little advertising to start with, limited to some ads that look more like sponsorship messages, including one from Mike FM, whose parent company CHCR produces the Greek program. As a result, commercial breaks are only a few seconds long, enough for a station ID, and the hour is backfilled with music videos or other short-form programming. For the quality of the actual programming, I’ll wait until they’ve had a chance to air more of it (and even then I can’t comment much on content because I can’t understand the language most of the time), but my first impression is that it’s uneven. Some of it looks like the kind of long-form talking-head shows that fit the stereotype of low-budget ethnic TV. The only thing that’s different is that it’s in a green-screen set and in high-definition, and has flashier computerized graphics (though not quite as well produced as the stuff you’ll find on the big national broadcasters). The shows are better when they take their cameras out in the field, which they do and want to do more (at least when the weather is nice). It’s considered a soft launch, without a major marketing push behind it, and it’s being run by a group of people who, while they have experience in television production, don’t have much experience running television stations. The manager of CFHD-DT (ICI), Montreal’s newest television station, has had to deal with all sorts of technical headaches while trying to launch it. But with the last of the technical issues resolved, he has finally set an official launch date: Wednesday, Dec. 11. It’s been almost a year since the CRTC granted Norouzi’s 4517466 Canada Inc. a licence to operate a new multilingual ethnic television station as part of a three-way deal that saw CJNT switch hands from Channel Zero to Rogers and become an English-language City station. As part of that deal, ICI will receive $1.067 million from Rogers for programming, in addition to free content from Rogers’s OMNI network. It also gets a loan of up to $1 million from Channel Zero, plus five years of free master control services. All this for simply taking over CJNT’s ethnic programming obligations and clearing the way for a City station in Montreal. ICI had hoped to launch by late spring or early summer, but a series of unforeseen problems caused delays. Like when his new antenna was delivered and parts of it were shattered in a million pieces. Or when, after finally getting a repaired antenna installed, it caused interference with a Sûreté du Québec antenna on the same tower (moving the SQ antenna up a bit solved that, but that took a long time because of all the coordination work involved). And, of course, there was the legal threat from the CBC, which wants to use the “ICI” brand for itself. That case is still ongoing. In August, the station began transmitting a test signal. It was then pulled off the air when the SQ interference problem came up. Last week, it returned, repeating an Italian-language program about Montreal’s Italian Week. The station is still officially testing until Dec. 9. ICI green-screen studio with new HD cameras. When the station does launch on Dec. 11, it will meet its requirement of 14 hours of original local programming a week, though Norouzi said that some of its producers are still waiting for some acquired programming. ICI is run as a producers’ cooperative. So the producers who work in various languages will buy airtime and produce or acquire their own programming and sell their own ads with it. Norouzi’s production company Mi-Cam Communications has been put at their disposal to help with the technical production aspects. ICI has a small green-screen studio at the Mi-Cam offices on Christophe-Colomb Ave. in Ahuntsic, though Norouzi said he wanted as much programming as possible to be shot in the field. No more poor-quality interview shows people are used to seeing on previous incarnations of Montreal’s ethnic television station. Shows ready to go include a Portuguese soap opera Norouzi says looks very good, as well as a cooking show and other programming from OMNI. ICI will, at least at first, carry OMNI News programs in Mandarin, Cantonese and Punjabi about 2-3 days a week. But overall the amount of OMNI programming on the station is very small, Norouzi said. Carriage: Norouzi said ICI will be carried on both Videotron cable and Bell Fibe when it launches. (Because ICI is a local station, its carriage is required by local cable companies, and that carriage comes without a fee.) He said he’s in talks with others (notably Bell satellite TV) for additional coverage. Montreal’s tenth over-the-air television station has begun transmitting. CFHD-DT, which wants to operate under the brand International Channel/Canal International (ICI) but is in some legal trouble with Radio-Canada over that, announced via its Facebook page and its Twitter account that it was on the air as part of its testing phase and would be airing promotional videos soon. The 5,500-watt signal, broadcasting from a Bell-owned tower near the police station on Remembrance Rd., is showing a partially blurred time-lapse cityscape video, with the callsign, an email address and the station’s logo at the bottom. The signal has no audio. The station is broadcasting on Channel 47.1 in 1080i high definition. Station manager Sam Norouzi, who has been very busy the past few weeks, tells me that the station should launch some time near the end of September or early October. Part of the delay is because he needs to coordinate with cable providers Videotron and Bell (Fibe) to ensure carriage on their systems. Because it’s an over-the-air channel, ICI will be carried on both cable systems’ basic packages, without a per-subscriber fee. Norouzi said there hasn’t yet been discussions with satellite TV services or out-of-market cable systems about carriage, so the station will launch without carriage on those systems at first. “It blows my mind the quality of the stuff we’re shooting,” he said. Unlike the kind of stuff seen on CJNT during the Canwest days, programming on ICI will be in high-definition, and have superior technical quality, he said. ICI is being helped through financial, technical and other assistance from Channel Zero and Rogers, who offered it so that the CRTC would approve Rogers’s purchase of CJNT and its conversion into an English-language station that’s now part of the City network. Rogers is giving the station more than $1 million in funding for programming, and Channel Zero, in addition to providing free master control services for five years, has offered to loan up to $1 million to the station. Rogers also offered up to 200 hours a year of free programming from OMNI, its ethnic network. Norouzi said at first he didn’t think he’d be using much OMNI programming. Now he says he’s looking at adding three programs from OMNI (but not the daily newscasts). Norouzi said much of the past few weeks have been spent on technical aspects, including installing the antenna (and having to fix it after it was accidentally dropped and broken during installation). “I’m going to write a book eventually about all the adventure,” he said jokingly. I thought nothing short of an alien invasion would unite the country. Heck, even then I’m sure the PQ would blame the federal government. But the CBC managed to do so last week when it announced that it was rebranding all its French-language services as “ICI”. But the move has been so universally condemned, from the left, from the right, from its enemies and its friends, that I feel the urge to play contrarian and find some reason to support it. But I can’t. It’s confusing. Are they changing the name Radio-Canada? No. Except yes. They’re not changing their name, but just adopting a new “brand identity”, or using a “term”, or “denominator”. Just the list of synonyms for the word “name” they used (including the word “name” itself) created needless confusion. Even CBC and Radio-Canada journalists couldn’t figure out what “ICI” was, exactly. It’s expensive. This rebranding exercise cost $400,000. You can see that as a tiny part of the corporation’s $1-billion annual subsidy from the Canadian government, or you could see that as a handful of well-paid full-time jobs for a year. Rebranding is an expensive endeavour that does little to further the CBC’s mandate. It’s unnecessary. The closest thing I got to a reason for this whole thing in the first place is a video (now deleted) in which someone put a confused look on their face when explained that “Radio-Canada” means both radio and television. I get that, in a sense. You’ll recall that Télé-Québec used to be called Radio-Québec. But is this really a problem for a brand that’s existed for 75 years? Does anyone who lives in Canada and speaks French actually get confused? It’s consultantism at its finest. The CBC loves consultants. People who tell them that newscasts have to look a certain way, or that Peter Mansbridge should stand at all times. Some consulting is good. You want to focus-group television shows or expensive concepts before putting them into motion. But consultants are also good at convincing people to buy things they don’t need. I don’t know if that happened in this case, but it certainly gives that impression. It’s abandoning a strong brand. Rebranding is something you do when your brand isn’t working. Maybe you’re involved in a scandal, or your name doesn’t reflect what you do anymore, or it’s not politically correct. But Radio-Canada is a very strong brand. People know what it is and expect good things from it. Why would you mess with that? Even the federal government got involved to complain. It’s anti-patriotic. Fuelling the exaggerated notion that Radio-Canada is filled with separatists (as if half of Quebec wasn’t), cutting “Radio-Canada” in favour of “ICI” has been seized by some in English Canada has a political move. “ICI” is also being seen as reinforcing the Quebec-centric view of Radio-Canada by groups that feel the corporation all but ignores francophones in the rest of Canada. It’s a generic word with little meaning. The Abbott and Costello routine from Jean Lapierre and Mario Dumont might be a caricature of the problem, but there’s a very serious lack of meaning in the term “ici”. It’s a generic word, an adverb, and they’re trying to use it as a noun. “ICI” has been the name of a bunch of things, including a weekly alternative newspaper in Montreal. “ICI Montréal” was even registered as a trademark by Télé-Métropole, which is now TVA, in 1985. But the biggest problem with this rebrand is this: It’s screwing the little guy. Here’s that little guy. His name is Sam Nowrouzzahrai, but he does business as Sam Norouzi because he wants to save people the trouble of always looking up how to spell and pronounce his name. 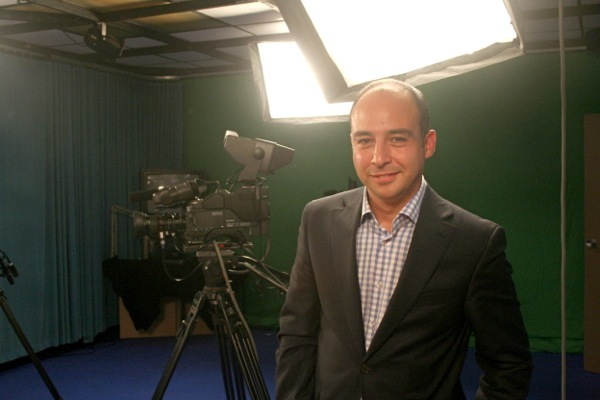 He’s the man behind a new ethnic television station in Montreal. It’s a mom-and-pop shop, owned by his family and run as a producers’ cooperative. He’s not looking to get rich off of this, just find work for some ethnic broadcasters and bring local ethnic television back to one of Canada’s most diverse cities. He wanted to call the station International Channel/Canal International, or “ICI” for short. As I explain in this story in The Gazette, Norouzi did his homework, applying for a registered trademark and waiting for it to get approved as the CRTC application process followed its course. Now, weeks before the station is set to go on the air, he has to deal with the CBC’s lawyers who are trying to take his name from him. And while he has a legal team to deal with that, it’s taking up a lot of his time too. “There’s not a day that goes by that there’s not an issue I have to deal with” involving the case, he said. I first wrote about this story in March, but now Norouzi has decided he’s ready to play offence in his David-vs-Goliath battle. Articles in the Journal de Montréal, La Presse, the Globe and Mail, the National Post, even the New York Times. An interview on CBC Radio’s As it Happens. An angry column from Sophie Durocher. And while he told me back in March that he didn’t have the funds to take this matter to court, he now says he’s ready to fight. So what kind of case does the CBC have here? Can they really force Norouzi to give up his name? I spoke with Pascal Lauzon, a lawyer and trademark agent with BCF. He said most of the case is “very debatable on both sides.” He pointed out that the registrar of trademarks looks through the database when a trademark is applied for. The process also includes a two-month waiting period so opponents can file oppositions to proposed registrations. But Lauzon also said that there’s a five-year period during which someone can apply to the federal court to expunge a trademark. Obviously not in a position to prejudge a case like this, Lauzon said the CBC has a strong case, not so much because it can prove it used the name first, but because of what amounts to a technicality. Part of the trademark registration process is the filing of what’s called a “declaration of use.” This tells the Canadian Intellectual Property Office that you have actually used the trademark you’ve applied for on a good or in connection with a service. Norouzi filed this on Aug. 20, 2012. But his station wasn’t on the air at that time. We didn’t even know it existed because the application for it wasn’t published until a month later. That, Lauzon said, is enough to have the entire trademark registration thrown out. If that happens, Norouzi would have to file for a new one, but that would put his application behind those 31 marks of CBC-Radio-Canada, and would weaken his case considerably. “He should have waited” until the station was on the air, Lauzon said. He had three years to file a declaration of use, and waiting would not have made his initial filing date of August 2011 any less valid. “If he had waited, he would be in a much better position,” Lauzon said. There is another way for this to end: The CBC could see the error of its ways and abandon the whole “ICI” plan entirely. Or it could offer to pay the costs associated with Norouzi’s station taking another name. I don’t know if either of those are likely. The CBC has already started to back away from ICI. On Monday, president Hubert Lacroix apologized for the “confusion” and announced that some services, including the main TV and radio networks, would retain the Radio-Canada name. You can see a full list here (PDF). Names like “ICI Radio-Canada Télé” and “ICI Radio-Canada Première” sound like awful compromises, taking names that were long and making them even longer. This backtrack was after days of trying to re-explain a move that should have been self-explanatory. It hurts to throw away a $400,000 project. But sticking with a bad idea isn’t a better option. In response to your questions sent yesterday (and I apologize for the delay), the term “ICI” has been closely tied to Radio-Canada’s identity for over 75 years. That it has risen to increased prominence recently is only a reflection of the close association our audience makes between that word and our brand. Confusion is in no one’s interest. That’s why the matter to which you refer is part of an ongoing legal process which is before the Federal Court. I hope you will understand that I cannot comment on the specifics. UPDATE (June 11): Read my follow-up to this story here. Sam Norouzi is a busy guy these days. He’s starting a television station from scratch. He’s dealing with the technical side, acquiring a transmitter and antenna, as well as the content side, dealing with show producers. The plan is to have the station on the air some time in the summer, with a formal launch in the fall. Norouzi is the manager of ICI, a new over-the-air ethnic television station in Montreal that was approved by the CRTC when it allowed Rogers to buy CJNT. Operating under the callsign CFHG-DT, it will air on Channel 47, using the same Bell-owned transmission tower on Mount Royal that was used briefly by CFCF as a temporary digital antenna while its analog transmitter was still running in 2011. ICI, which stands for International Channel/Canal international, wants to bring ethnic television in Montreal back to where it was before CJNT, a producers’ cooperative where people sell advertising for their own shows and the station doesn’t try to make money by pushing the limits of its licence with third-rate primetime American programming. It’s a big undertaking, with a very large amount of local programming, and it’s being put together on a pretty short time frame. But now Norouzi has a new headache to deal with: The CBC doesn’t want him to use “ICI” as the station’s name. The public broadcaster sent a lawyer’s letter to Norouzi’s company this week asking it to cease and desist the use of the name ICI. A statement of claim was filed with the court on Monday noting CBC’s request to have Norouzi’s trademark for ICI expunged. (Hat tip to the Citizen’s Glen McGregor for alerting me to that.) Norouzi (whose real name is Nowrouzzahrai) wasn’t aware of the letter when I called him Wednesday afternoon, because he’s currently in Florida. After checking in with his father, Norouzi confirmed he had received the letter. There’s another reason, though. Le Devoir reported Wednesday that Radio-Canada is thinking of rebranding, and calling itself “Ici.” Needless to say that would cause confusion. A search of the Canadian trademarks database shows that the CBC registered a series of trademarks last fall with the word “ici” in it. But Norouzi also has a trademark registered for his use of the term “ICI”. That trademark was filed in August 2011 and registered in September, before the CBC’s trademark applications were filed. Asked about that, Pichette said “ici has been a Radio-Canada staple for decades” because it’s been used with the Radio-Canada name (à la “Ici Radio-Canada“). He didn’t say why the CBC is only acting on this now while the TV station’s use of the name ICI has been known since at least last fall and its trademark dates back a year and a half. Norouzi said he was frustrated because he’d done everything he was supposed to, making sure nobody else was using the name for a TV station and then registering it himself and getting it approved. He said he doesn’t have enough money to hire lawyers to fight the CBC’s legal department, which means if the CBC decides to make this a legal case, it will probably win by default. All this over a three-letter word. UPDATE (March 28): Asked about the possible name change in the House of Commons, Heritage Minister James Moore says its name is enshrined in the law and it won’t change. Though I’m not sure how much control the government has over branding. The logos above show the official name would remain “Radio-Canada” but with brands focused on “ici”. Meanwhile, CBC announces it’s going ahead with the rebranding, but Radio-Canada’s name remains “Radio-Canada”. On Thursday, the Canadian Radio-television and Telecommunications Commission gave its approval to applications by Rogers and 4517466 Canada Inc. to reorganize over-the-air television in Montreal and add a 10th television station to the market, the first new one in 15 years. My Gazette story on this news is here, including comments from the various players. As with all ownership transactions it is the responsibility of the seller or its representative to prove that a transaction is in the public interest. The Commission has been abundantly clear about this recently. This means that the burden of proof lies with Rogers and Channel Zero. This is not simply a matter of promising to invest a certain amount of money in the Canadian broadcasting system, many other factors must also be taken into consideration, including the impact on the Montreal market and the Commission’s various policies. This was the statement at the beginning of last month’s hearing by Jean-Pierre Blais, the chair of the Canadian Radio-television and Telecommunications Commission. Combined with the grilling that the commission gave to the three parties involved in two applications related to the purchase of CJNT by Rogers, it’s clear that the commission’s hard line about acquisitions wasn’t just a one-off for Bell’s sake. It’s not that Bell Media, which owns CTV, is opposed to adding a third private English-language station to the Montreal market. But it tells the CRTC it thinks such an application should be done in a straightforward way with a call for new applications, rather than the roundabout two-step process that Rogers is proposing with CJNT. Normally, when an application is made for a new commercial television or radio station, the CRTC responds by evaluating the market to see if it can sustain an additional station, and if so issuing an open call for applications. The various applications are evaluated and the commission chooses the best one. With the Rogers acquisition of CJNT, which it proposes to convert into an English station, and a related application for the new ICI ethnic station, which would take over the ethnic programming responsibilities from CJNT, the new application isn’t technically for Citytv, but for an ethnic station to replace an existing one. In comments filed to the CRTC, Bell’s vice-president of regulatory affairs Kevin Goldstein says Rogers is “looking for an extraordinary result from this process” and the CRTC should reject the application, instead issuing an open call for applications for a new English television station in Montreal. Indeed, he questions why it wasn’t the group behind ICI that didn’t seek to acquire CJNT, and Rogers issue the new application. Timing: Bell points out that if the two applications are approved, the ICI service would take some months to launch, while Citytv could be converted into an English television station “essentially overnight.” In the interim, Montreal would be absent any ethnic programming on local television. Programming: Though it doesn’t object to Rogers’s proposed English programming grid per se, Bell does suggest that it might not be the best option in terms of local programming. It points out that the station would have “limited local news” which would be done within a morning show and a weekly sports show. Goldstein suggests that, with an open call for applications, another proposal could offer a better option that would have more or better local programming. Bell’s main objection, that Rogers seems to have structured this plan as a clever way to get around normal CRTC process for a new television station, makes a lot of sense. But it’s also kind of an academic argument to make, for the simple reason that there’s little demand for new conventional television stations. I’d be surprised if an open call for applications for a commercial English station would result in an application from anyone other than Rogers for the simple reason that there’s no other large mainstream commercial Canadian television network that doesn’t already have a station in Montreal. The only other networks in Canada are the small, mainly religious Joytv and CTS. In 1996, when Canwest applied to acquire Quebec City station CKMI-TV and convert it into Global Quebec, CFCF objected strongly, saying the market could not sustain a second television station. Ownership of CFCF has changed a few times since then, though. It was a double-whammy this week for ICI, or at least it would have been if that newspaper still existed. Late Thursday came word that Nelly Arcan, née Isabelle Fortier, was found dead in her apartment, in what police are apparently treating as a suicide. On Friday evening, it was Pierre Falardeau, the “colourful” political commentator and filmmaker, this time of cancer. Both were former ICI columnists, and both continued writing under the 24-Heures version. Falardeau stopped during his cancer fight, but Arcan’s final column was published the day after she died (it includes no mention of that, since news came out after the paper went to press). The ICI columnist page looks more like an obituaries page now. The two main stories on 24 Heures’s homepage right now are obits for Arcan and Falardeau, though the first reads more like a police blotter. The tributes are still pouring in. For Arcan, whose death was much more surprising than Falardeau’s, there’s a level of … let’s call it discomfort. The media don’t normally report on suicides, for fear of encouraging them. But you can’t simply ignore the death of an important figure, nor can you fail to mention how they died. So here there’s no choice. There’s also the problem of unanswered questions. We still don’t know how she decided to take her own life (everyone has that morbid curiosity, whether we like to admit it or not), and more importantly why. The first answer is known by a few, the second probably only by one, who now can no longer speak. Nicolas Ritoux has an open, personal letter to Arcan, which gives a window into her troubled soul. Being a public figure who has written extensively, we can also go through the media archives, looking at her interviews and her writing in a different light. P45 magazine unearths an article written by her about suicide back in 2004, though it doesn’t delve into the personal. Cyberpresse similarly collects some of her thoughts on the subject. Bazzo.tv has video of an interview with Arcan last fall, which talks about how she chose her name and her fears in life (one of which was losing her parents – ironic since those parents are now living their worst nightmare). Cyberpresse has opened up an entire dossier on the subject. In Falardeau’s case, the death wasn’t so surprising. Falardeau had been fighting cancer. If obituaries hadn’t been written in advance, journalists could at least have suspected they’d soon have to write one. Expressions of condolences are coming in from all parts, from Guy A. Lepage, Pauline Marois and others. Perhaps because more people knew him, because he made more of an impact on the lives of Quebecers. Or maybe it’s because talking about his death isn’t awkward, even for those who disagreed with everything he said. UPDATE: Now talk of naming a street after him. Also: More Gazette pieces on Falardeau and Arcan. Quebecor has just announced that it is shutting down Montreal alt-weekly ICI, with its last print edition coming out tomorrow. From then on, columns will be published online and in an insert in the Thursday edition of 24 Heures, another Quebecor paper. The move results in nine layoffs of permanent employees as well as a loss of income for 15-20 regular freelancers. Quebecor’s release takes great pains to say that the company did whatever it could to prevent the paper’s shutdown. I guess that’s supposed to include forcing freelancers to sign abusive contracts, a move that led a high-profile columnist to leave. AJIQ, which represents independent journalists, didn’t mince words in blaming ICI’s downfall on its treatment of freelancers, which I think is pushing it a bit. In the end, it probably made little sense for Quebecor to produce two free newspapers in Montreal in addition to the Journal de Montréal. So ICI is being canibalized in favour of 24 Heures. The big question now is what happens to The Mirror, the anglo alt-weekly which is also owned by Quebecor. This move leaves two anglo weeklies (Mirror and Hour) and one franco (Voir). Voir and Hour are both owned by the independent Voir Communications. Then again, The Mirror is older than ICI and the disparity in readership on the anglo side isn’t as high as it was with Voir and ICI. Quebecor confirms this, saying there’s no question about The Mirror being shut down. It’s unclear where ICI’s voices will head now, though most are expected to stay with Quebecor in some capacity. Sophie Durocher will (continue to*) have a column in the Journal de Montréal’s weekend section, and Pierre Falardeau is expected to stay on in some capacity, according to Le Devoir. Two journalists will move to 24 Heures. ICI’s show on Videotron’s Vox channel, Ici et là, will also continue for the time being. Some of ICI’s contributors didn’t find out about the closing until Quebecor’s press release caused journalists to ask them for comment. UPDATE (May 5): Michel Vézina gives his take in his Montréal Express column. *UPDATE (Sept. 25, 2010): Sophie Durocher wishes to clarify that her Journal de Montréal column predates the lockout, so she isn’t replacing any unionized workers. Earlier versions of this post also contained a comment about her that, in hindsight, was somewhat unfair, and may have led people to the wrong impression about her Journal column. Quebecor, tired of the “misinformation” being put out by the union representing locked-out Journal de Montréal workers, has responded with a website of its own at www.lheurejuste.ca. It features management responses to union talking points, though nothing we haven’t heard in the media and in articles in the Journal over the past week. It also has PDF copies of those two-page spreads from the employer repeatedly re-explaining its position (one of the links is broken – the rest are giant images rather than properly-created PDFs). And you can download copies of ads saying how great Quebecor Media is at creating jobs, complete with stock photos of happy employees. It’s kind of hard for Quebecor to play the victim here since they started the lockout without even making a contract offer. Their reverse-talking points are also less than convincing (they won’t say how much the Journal makes, though they admit that it’s still profitable). The best rundown comes from TV critic Richard Therrien, who criticizes Martineau for siding with the Journal against the union and for saying that the Journal and TVA have editorial freedom to criticize each other. The most unintentionally funny one comes from Pour un monde à droite, a blog with pictures of Stephen Harper and Conservative Party logos all over the place. Naturally, they see the show as a huge win for Richard Martineau against the evil unions and Radio-Canada. It’s one of the few blog posts defending Martineau’s appearance on the show. Matt Ouellett-Boucher’s blog is also worth reading. He writes a long piece about how Richard Martineau changed when he moved from Voir to the Journal, and how he’s become insufferable since. Sadly, Radio-Canada still doesn’t put TLMEP online, so if you were busy watching the Super Bowl, you’re out of luck. UPDATE: Therrien points out that TVA’s Le Banquier (which had Quebecor boss Pierre-Karl Péladeau on board in what I can only assume is a funny coincidence) had better ratings than TLMEP. The union is collecting evidence of scabbing at the Journal, according to the one-sentence lead of this paywall-blocked Le Devoir piece. Premier Jean Charest says his government shouldn’t encourage the Journal and discourages his ministers from giving interviews, but he says they won’t kick the paper’s journalists out of press conferences. The Association des journalistes indépendants du Québec says articles from Quebecor-owned alt weekly ICI have found their way into the Journal, thanks to a new we-take-all-your-rights contract that ICI forced its contributors to sign and disgusted at least one columnist enough for him to leave. La Presse says Gilles Proulx will be the next freelance columnist to leave the Journal, following in the footsteps of Bernard Landry, Geneviève Lefebvre and others. Patrick Lagacé speaks of the Journal this morning, pointing out that many of the newly-hired managers look more like journalists than managers (I noticed that too), and that layout being done in Toronto is what’s keeping the Journal publishing – if they had to do that as well, their jobs would become a lot more difficult. Today is Buy a Newspaper Day, which won’t help the workers at the Journal much. Think your freelance contract is bad? Quebecor-owned free weekly ICI is making its writers sign a new contract that demands all rights, including copyright and moral rights, be handed over to them, in exchange for a measly $55 per 250-word story. This has gotten them a strong denunciation from the Quebec association of independent journalists (AJIQ).